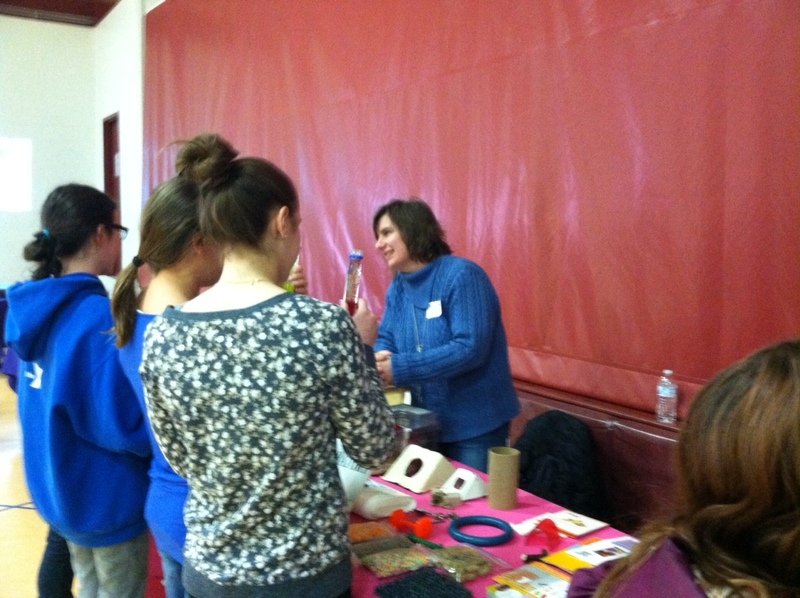 On March 21st, the Park Forest Middle School in State College, PA held its annual STEM (Science, Technology, Engineering, and Math) fair. Approximately 500 students in the 6th through 8th grades participated. As part of this program, the Animal Resource Program at Penn State University set up a table to talk about the use of animal models in research. The AALAS Foundation generously provided many outreach materials such as puzzles, hand-outs, and CD’s. The stall also displayed a variety of environmental enrichment items for various species from mice to primates. This is the third year the Animal Resources Program have participated in the STEM Fair and besides the environmental enrichment items they also have a game developed by Americans for Medical Progress (AMP). The Research Trivia Game consists of a game board and various trivia questions. These can be found on the AALAS Foundation website. Groups of children are given a statement about a type of research animal whose picture is on the game board. Those that get the answer right win a prize. This year winners received a stuffed animal generously supplied by Carter 2 Systems, Inc. and Charles River. Additionally, there were goodies from Bio-Serv, the AALAS Foundation, and other vendors associated with animal research. The fact that the prizes ran out and someone had to make a mad dash to the local super market to buy some candy to hand out suggests the table was popular. 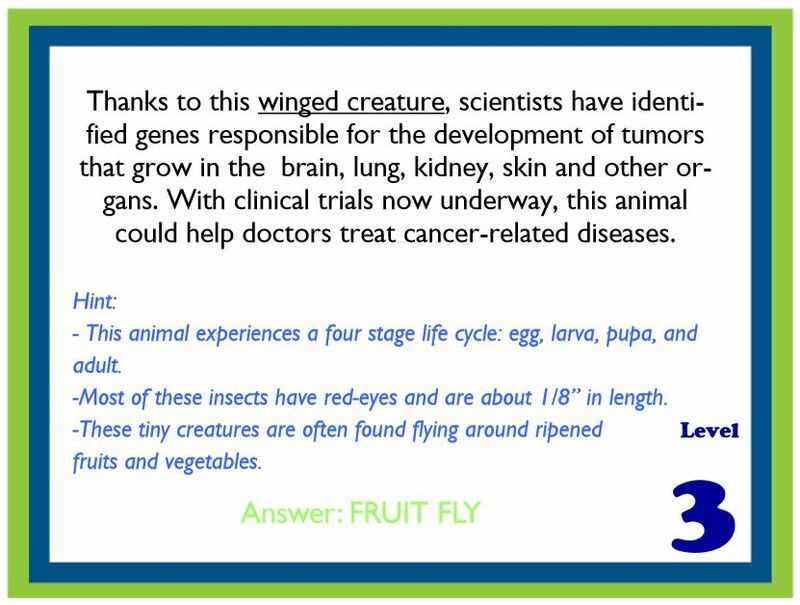 Excerpt from the Trivia Game: Would you have got the answer? The Park Forest Middle School has student representing a diverse background and with that their perceptions on the use of animals in research and in general. Many are the children of the farmers in the surrounding area. These students tend to have seen the direct benefits of animal research in the form of antibiotics for their livestock, better formulated feed, and general veterinary care. There are also students whose parents work Penn State University or in business around the university. These students have a mixed impression of animal research. Many students who visited the booth, while not necessarily opposed to biomedical research using animal models, were not aware of all that is done regarding animal welfare. They were surprised at the number of different enrichment devices used to allow the animals to exhibit normal behaviors. For example, providing nesting materials for mice or foraging boards for primates. The students also seemed to enjoy learning about the how different animals have been used to advance our knowledge or find cures for diseases. While most of the students professed to “liking” animals, there were none that suggested they were opposed to animal research. It’s vitally important that we in the scientific research community participate in these types of outreach opportunities. PETA has long targeted children from grade school through high school. It’s imperative that we continue and build presenting the truth about the work we do to this age group. This is when they begin forming their ideas about not only what types of jobs they’d like to have, but how they view issues. If all they hear is the animal rights side of things, then we’ve lost a key moment to present the truth. It’s also important because we need to reach out to the next generation of researchers, animal caretakers, those that will work for the various vendors, and veterinary staff. Many students who visited the booth talked to had no idea that this type of work existed. We need caring and compassionate people to continue the work of the research community. Those who visited the booth were shown a Whyville page that has various games related to animal research geared towards middle school kids. The AALAS Foundation has also recently launched the CARE website that has information about working in the field and links to pages such as the 4Research page. Kids are genuinely interested in the type of work the research community does do, and it’s important that we get out and talk about it to them. Besides providing good and interesting information to the kids, it’s a lot of fun! Posted on April 16, 2014 April 16, 2014 by EditorPosted in News, Outreach NewsTagged AALAS, outreach, Penn State University, STEM fair.